The first annual Stone Soup Film Festival is happening on October 17th and 18th in the Britannia High School Auditorium! 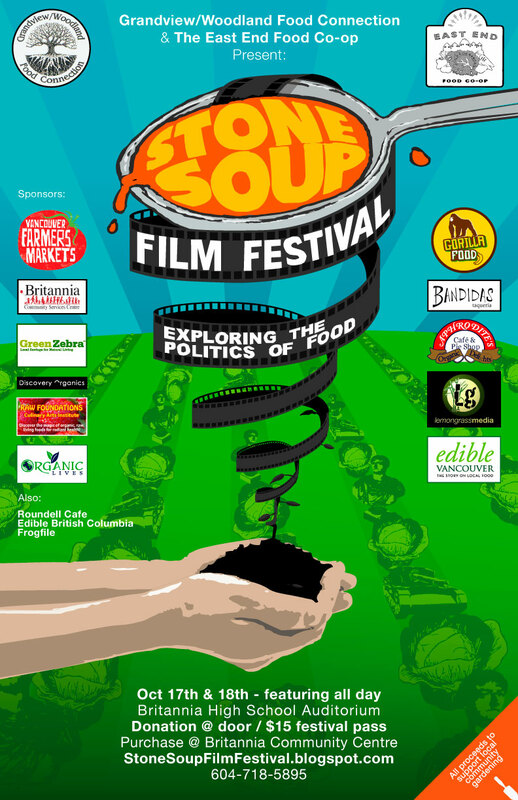 Through the screening of several international, Canadian, American, and homegrown BC films, we hope to expose and educate as many people as possible on the politics of food from what’s going on right here in Vancouver to Los Angeles to Jamaica. Tickets are either by donation at the door per film slot or you can by a weekend festival pass for only $15. All proceeds go to community gardens. You can’t argue with that price and that cause! Festival passes are available at Britannia Community Info Centre and Health on the Drive (1458 Commercial Drive). Bring your friends, family, sisters, brothers, co-workers, it really is going to be a wonderful weekend and we can’t do it without you!